Charged during the day and lighting up at night, this beautiful bicycle trail outside the town of Lidzbark Warmiski is designed to improve safety for riders out after dark. 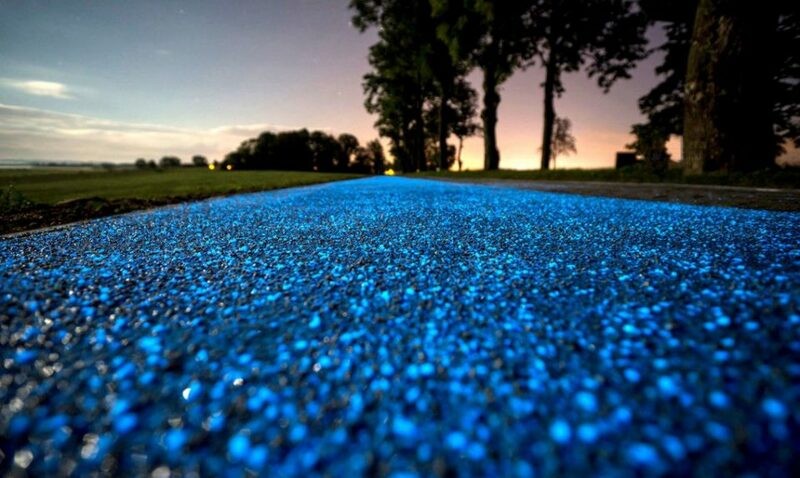 Luminescent phosphor can hold emit light of various colors, but blue was selected to match the surrounding landscape and conjure associations with the sky (the source of the path’s power). Once deployed, the passive system recharges itself, obviating the need for connectivity or continual maintenance. 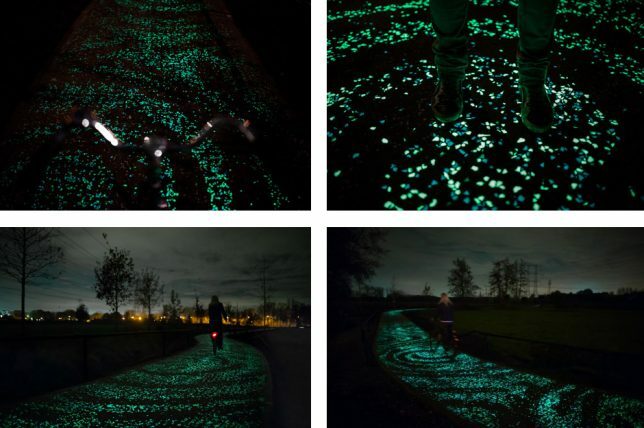 Though the technologies behind the effects differ, the path in Poland was inspired in part by the Starry Night bike path created in the Netherlands by Studio Roosegaarde. Both are proofs of concept, tests meant in part to demonstrate the potential and durability of this trail-blazing lighting strategy. 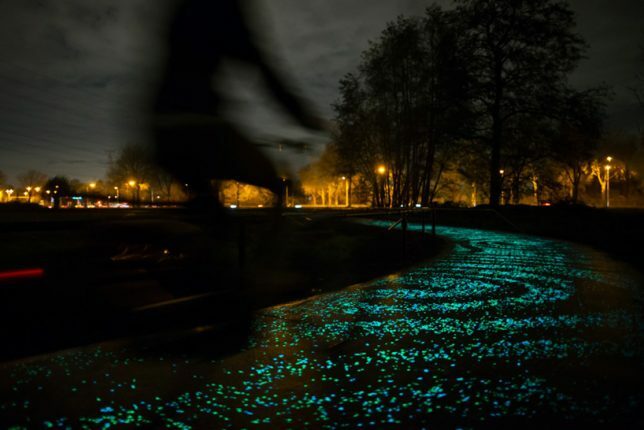 Other illumination options were considered, but this glow-in-the-dark approach was deemed both appealing and cost-effective by the Board of Regional Roads. 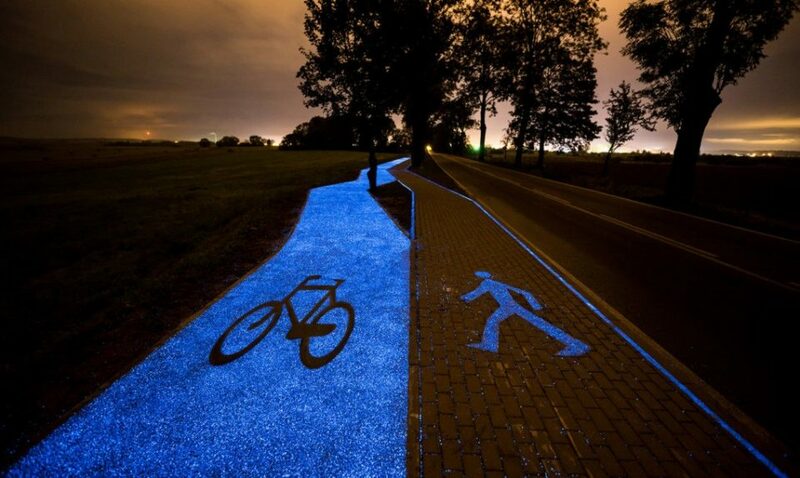 Adjacent pedestrian paths are also bracketed by glowing blue lines and denoted for persons on foot with likewise-illuminated path signage underfoot.